A personal injury can change your life forever. Accidents causing personal injury are unexpected and injuries may be physical, psychological or both, and may result in permanent disability. What’s more, accident victims are often unprepared for the long-term effects that frequently result from wounds such as fractures and spinal injury. If you reside in the Chatham-Kent area and have been injured in a motor vehicle collision or other accident, you are advised to contact the Personal Injury Lawyers of Ontario (ILO) serving Chatham-Kent. The ILO law group offers extensive personal injury experience and personalized service to our clients. We are easily accessible through our numerous member locations throughout Ontario. One of the first steps after you have been hurt or injured is to seek medical attention. Even if you believe that your injuries are minor you should nevertheless consult with a medical practitioner to assess your injuries because your symptoms or injuries may not be immediately apparent. Consultation with medical professionals will not only improve your rehabilitation, but a medical diagnosis will also increase your chance of success when seeking rightful benefits from your insurer. Below are some of the injuries that may be experienced by car accident victims, including drivers, passengers and pedestrians. Any of these injuries may result in severe or permanent damage. A slip and fall is one of the most common accidents that occur in Ontario. Some of the following injuries are often associated with a slip and fall. You are entitled to compensatory damages for severe or permanent injuries that occurred as a result of the carelessness of another individual or facility. Accident victims may receive compensation, for example, for pain and suffering, loss of income, medical expenses, rehabilitation costs and family expenses. It is wise to speak with a personal injury lawyer before submitting an insurance claim or accepting an offer for compensation. Rehabilitation and healing may be expensive and take years, which is why it is particularly important for victims to receive adequate funding for expenses. Regardless of whether or not you have already initiated contact with an insurer, we will assess your claim with a free initial consultation. 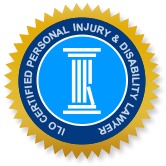 By hiring a Chatham-Kent ILO personal injury attorney, you are assured of the services of an experienced team to help you navigate through the often complicated legal procedures that surround your claim. We are well rooted within the community and have solid and professional relationships with the medical and rehabilitative centers that can best help you recover from your injuries. Visit our site today for more information on the services we offer to existing and potential clients.